27th July 2008. St Mary's Rougham Sunday Service started with an unusual event. The Rector, Rev. Nick Cutler, presented Maurice J. Rose (Tower Captain) with a Dartington crystal clock to mark his 50 years man and boy as a ringer at Rougham. Thanking him for his dedication perseverance and making sure the local residents would be aware of the services. Maurice has kept all six bells in the tower in good order and regularly rung, with 14/16 on practice nights and 6 or more on Sunday mornings. Unable to pass an opportunity, Maurice delivered a heartfelt thank you to the congregation for the clock and his band of Rougham Ringers for their support. Although no idea about the presentation, Maurice had been invited to choose 6 hymns for the service none of which mentioned bells!! The Sunday Service Band readily joined the congregation in appreciation and applause. The morning service was off to a good start!. 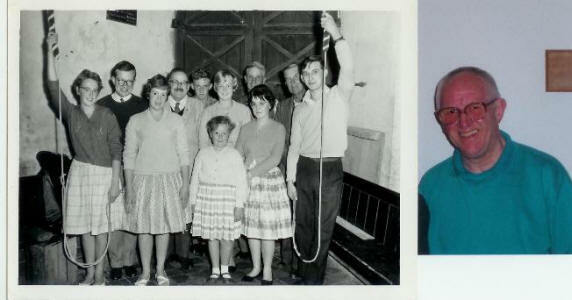 on 50 years of ringing.